The breathtaking beauty of Albany's rugged coastline creates a fitting backdrop to a dramatic whaling, convict and settler history and a sensational south coast adventure. The Albany Highway gets you there in just five hours from Perth, while a direct flight from Perth airport will whisk you there in one hour and 15 minutes. Or why not take your time and enjoy one of the world's greatest journeys, walking the Bibbulmun Track that runs from Perth to Albany. This charming city marks the spot where the first European settlers set foot in Western Australia, and much of their legacy remains today with around 50 colonial buildings standing proudly as museums, galleries and restaurants. From convict prisons, whaling ships and taverns to quaint cottages and grand National Trust residences, you can take in almost two centuries of history on a 30-minute self-guided walk, following the Amity Trail. Albany's King George Sound also marks the spot where the first convoy of ANZACs departed for the battlegrounds of the First World War. Today, you can follow their extraordinary stories through the National Anzac Centre's state-of-the-art interactive displays. You'll also find some of the town's biggest tales in the Historic Whaling Station at Discovery Bay, the only museum of its kind to be housed in a former whaling station. The industry met its end in 1978, creating a safe port of call for migrating humpback, southern right and blue whales. Spot them from the shore or join a whale watching cruise for a magical encounter. One of the most scenic areas for whale spotting and cliff-top walks is Torndirrup National Park. Here, the Southern Ocean has sculpted the granite coastline into striking formations known as The Gap and Natural Bridge. 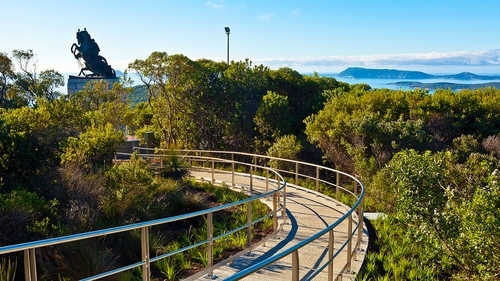 For sensational views over King George Sound, head for Middleton Beach boardwalk trail. Or take a drive up to Albany Wind Farm and feel dwarfed by the towering turbines. As well as world-class hiking, you'll also find some top-notch spots for fishing, sailing and diving. A weekend visit also brings the iconic Albany Farmers' Markets. No imports here, just fresh and fabulous, locally-grown flavours.